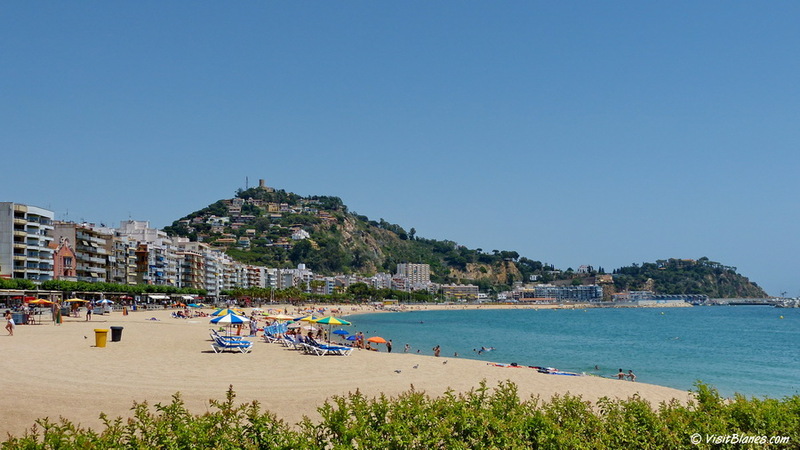 Platja de Blanes (literally, the beach of Blanes), fronts the old town center. This popular beach is 625 meters long and 30 meters wide, and stretches from Sa Palomera — the rocky promontory that separates the old village from the El Pins tourist district — to the yacht marina at the harbor. There are far fewer hotels in this part of town, so you will find more locals on this beach than at S’Abanell. 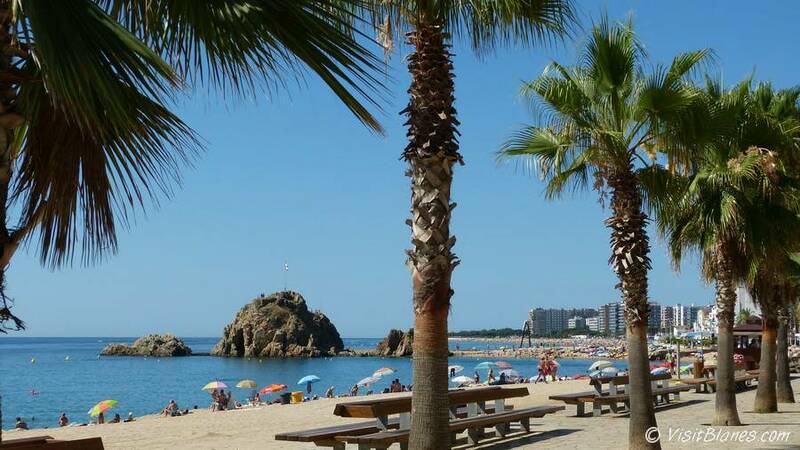 Most of the tourists who use Platje de Blanes stay in nearby self-catering apartments. Incidentally, many of the locals have the peculiar habit of picking a spot rather close to other beach-goers — even if there is plenty of space available. If that would bother you, put down an extra towel or two to mark your spot. Just at the start of the promenade there is a drainage ditch designed to sluice runoff rain water to the sea. It usually contains some still, foul-smelling water, and in general you won’t want to sit too close to it. The ditch has a wall on its southern side, isolating the stretch of beach across from Sa Palomera, which technically is part of Platja de Blanes (up to the path that leads to the rock, while the narrow strip of beach on the other side of the beach is part of S’Abanell). On either side of the ditch (but well enough away from the smell) you can rent sunbeds and parasols — at around €4 or 5 each. If you want to get a bite to each you can usually leave a towel on the bed, but do not leave valuables. Close to the marina the beach widens significantly, and then curves around toward the entrance of the port. The stretch of beach along the marina was created during the port expansion project that was completed in March 2012. It is a popular spot because if offers a nice view from the sea and Sa Palomera to the boulevard and the rest of the beach — and because at the end of the day the sun hits it long after the main stretch is already in shadows. Parents with young children will appreciate the fact that the water here is far more shallow than elsewhere along the beach, where the bottom drops off significantly after just a few steps. The jetty at the entrance of the harbor is a magnet for pole fishers. The widest part of the beach is often used by school classes — sometimes many at a time — and thus is not always the best place to choose. Too, the ferry boats arrive here, and if you pick the wrong spot you’ll have share it with throngs of passengers. There are a number of showers and concession stands along the length of the boulevard. Public toilets are located near the ditch; near the middle of the beach across from the traffic lights at Carrer Ample, and at the small park-like area just behind the stage (at the point where the paved boulevard narrows into a smaller path). A larger (bright yellow) toilet building, first aid facilities, and access for the disabled are located next to the boulevard at the far northern end of the beach, just next to the marina. Tip: On the street along the boulevard — almost directly across from the yellow building — is a small supermarket where you buy cold drinks, chips, and the makings of a sandwich without breaking the bank. 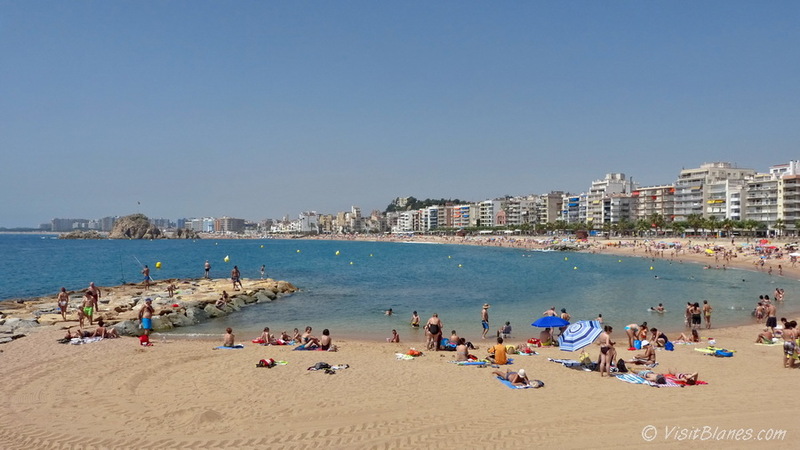 Platja de Blanes is lined by a popular promenade, which during the tourist season is home to many outdoor restaurants as well as various activities, ranging from Paella cook-offs to Sardana competitions, and from the busy Monday-morning market to special events usually related to one of the many locals feasts. In the evening well-dressed locals take a stroll here, meeting friends and neighbors along the way, and taking a break now and then on one of the many benches that line the promenade. The food at eateries along this boulevard rarely rises above the level of a typical fast food snack bar, and service ranges from overly solicitous to downright rude. Yet you certainly can find some great exceptions. We recommend Marathon (fantastic shoarma) in particular. For coffee, pastries and traditional Catalan sandwiches, try Casa Oliveras, a typical locals’ place with menus in Catalan only (though some of the waitresses do speak English). Good beer and inexpensive but good quality snack bar-type food can found at Suite Café — close to the stage on the boulevard.